JA-We don’t look for perfection, we look for potential that needs to be highly polished. JC-Do your research. Pick 5 ideas you love , then pick the one that seems the most exciting. Be sure to research comp books. You can change the setting to make an idea you love more unique. JA-We are looking for something that is truly unique. If we love something, we will find a home for it. What is expected of an author besides writing? JA-Social media, tours, school visits, marketing. First books allow you take lots of time but after that, you’re expected to produce. LP-Second books can’t be obscure and quirky. Your sales are being tracked (Book Scan) and you have to be pragmatic about what you pick in the beginning of your career. JA-There is less time today to build a career. DW-Placing your second book is just as important as placing your first. JA-Do your homework first. LP-Make decisions that progress your work, not just add another book. Selectivity. And be professional! JC-About social media: Why do we all have to say EVERYTHING we feel. Have a filter. Be cautious and professional. LO-Ask…Is this the highest and best use of your time. 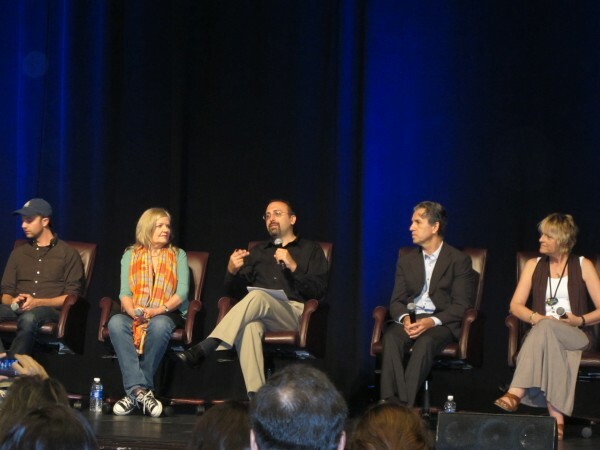 JA-Children’s and YA have historically done thing differently than adult publishing and that is why we’re doing well. Now on to the picture book panel. I’ve dabbled with picture books but don’t consider myself a picture book writer at this point in my career, but I am so glad that I stayed for this session. 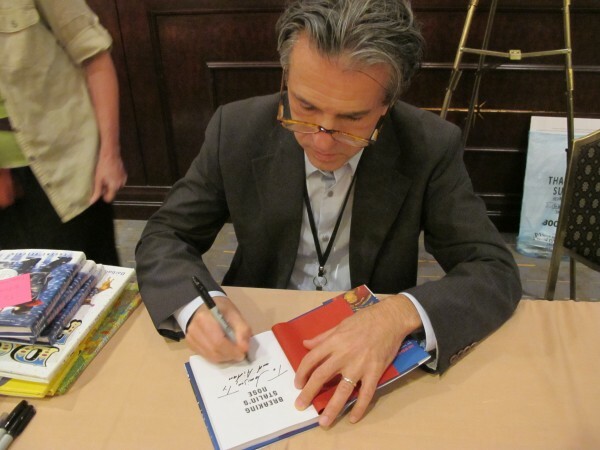 The wonderful insight and messages transcended the world of picture books and I walked away with a large amount of wisdom and inspiration–plus a whole bunch of laughs. 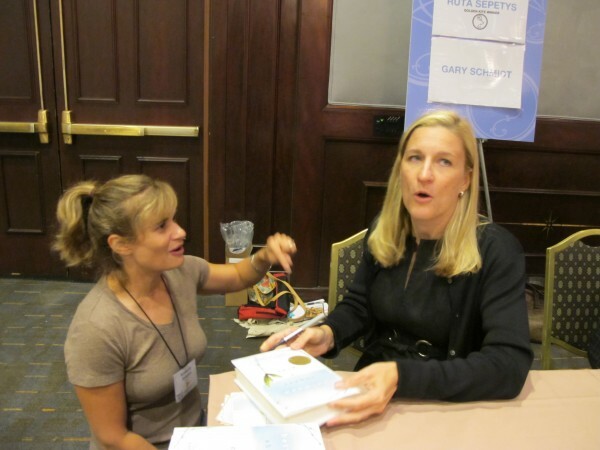 JK-Trends apply more to novels because PB’s don’t have as much trouble explaining themselves. Don’t need comps the same way. DY-We never get tired of hearing the same stories–we just want to have a unique delivery. EY-You do your research, but it still has to filter through you. The first breakout session of the day was one that is close to my heart. 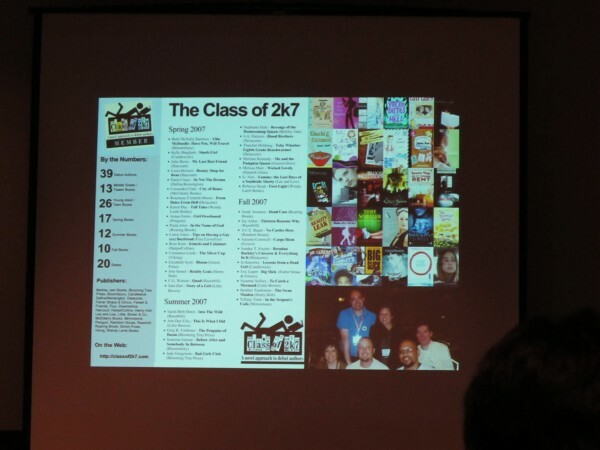 The Class of 2k7 (The founding class of 2k’s) is celebrating it’s 5th anniversary and of course that makes me a member of the 5th class to come through. 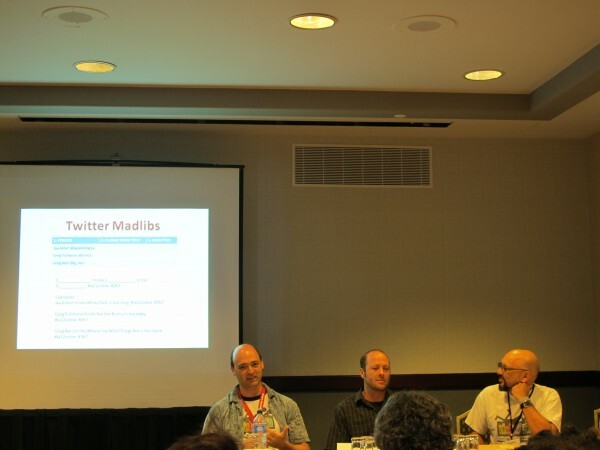 Of course I had to attend this session by Greg Fishbone, Jay Asher and Greg Neri called CLASS OF 2K7: SOCIAL NETWORKING YOUR WAY TO THE VIRTUAL TOP. *They may have started as a group of balding male writers. LOL! *Online marketing was very new and not the primary focus. *MySpace was the big thing LOL! But it shows that social media is a moving target and you can put a lot of effort into something that just goes away. *Lends credibility to the authors–looks professional. There are groups beyond the Class of 2k series that do this also–like the Apocalypsies and the Lucky 13s. 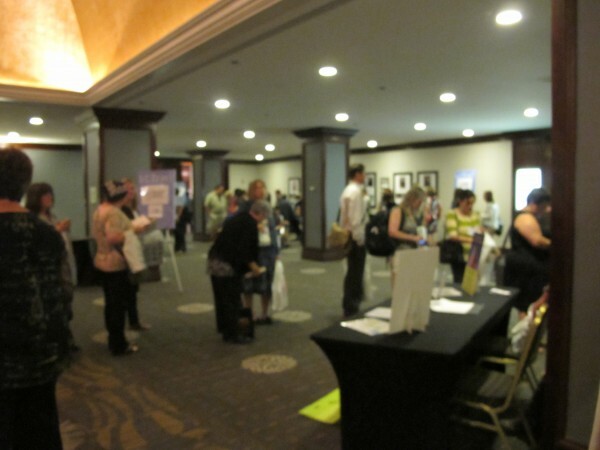 *Joint presentations/signings make something an event. *You better control your own spin. *Class of 2k13 They are just getting started! 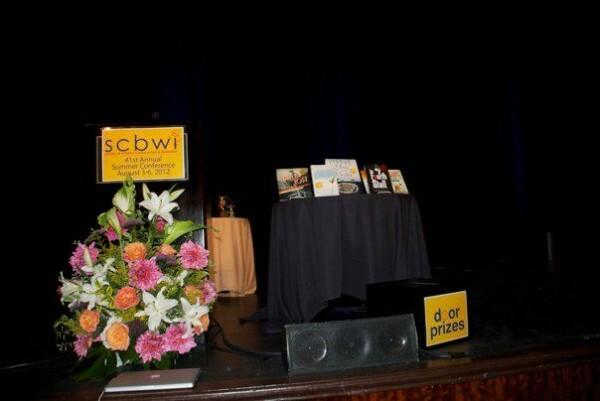 Up next was the SCBWI Golden Kite Luncheon. 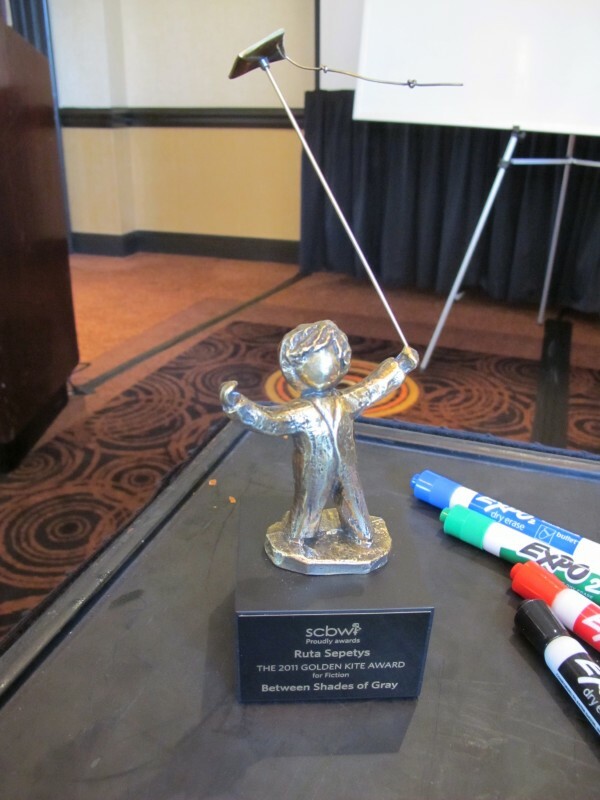 If you’re not familiar with the SCBWI Golden Kite award, you can find out more about it HERE. 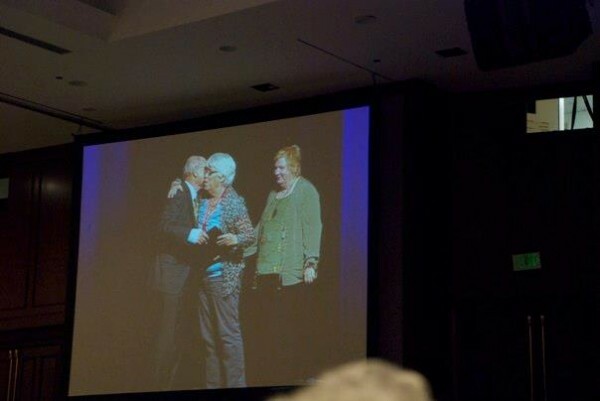 The awards given out at this luncheon also include the illustrator awards, the humorous Sid Fleishman Award and the SCBWI Member of the Year Award, which was deservedly won by Suzanne Morgan Williams. 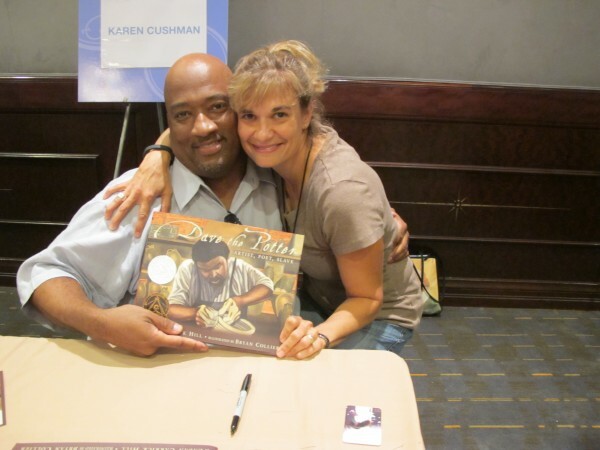 And this year was also very special for me because Kate Messner won the Golden Kite Picture Book Award. 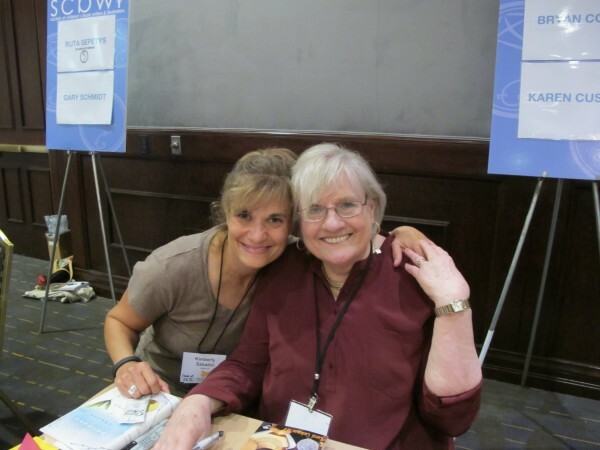 Kate is a member of my SCBWI Eastern Upstate New York and one of the authors I used as a role model when I first started this journey. Congratulations Kate!!!! 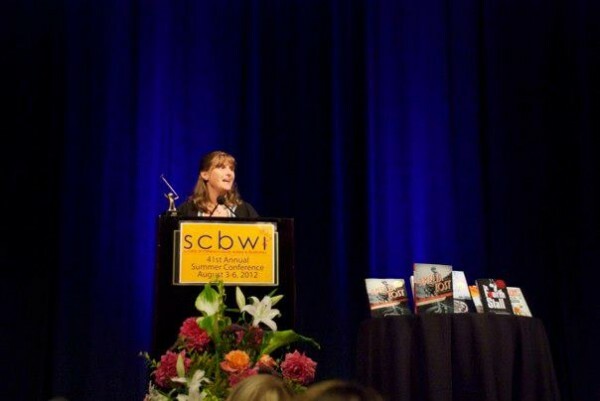 So proud to see what the SCBWI is producing. Each book is a stone in a path that we are all creating together. I’m so amazingly proud to be a part of this tribe. 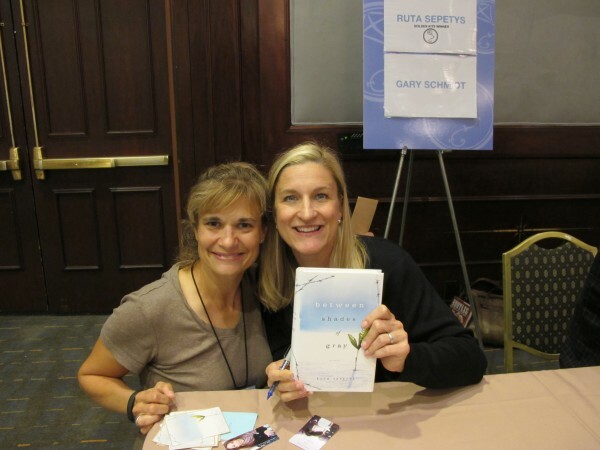 After the luncheon I got to go to another breakout session with Ruta Sepetys!!! This allowed me to get an up close look at a Golden Kite award…too stinkin’ amazing! Who needs an Oscar when you can have one of these? 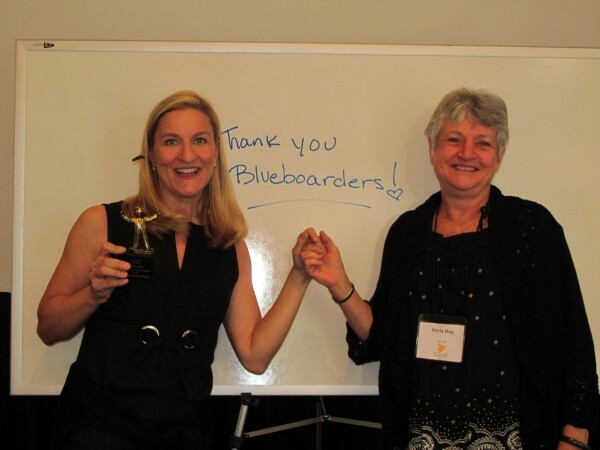 And of course, Ruta sent out a message of thanks to all of Verla Kay’s Blue Boarders when she saw Verla in her session too. Okay, back to topic–which is–SELLING, PROMOTING & TOURING IN FOREIGN MARKETS. I wasn’t sure how much I’d get out of this session because I have 3 young kids and hopping on a plane and touring overseas isn’t going to be the easiest thing for me to do, but I’d learned so many fabulous things in my other sessions with Ruta that I couldn’t pass it up. I wasn’t disappointed. I learned a ton of information that will give me lots of advantages to dealing with foreign markets even if I’m staying right at home. *If you send video content–attach a script for easy translation. *Have a selection of author photos because tastes vary widely. *Create your own Q & A. *sob* The last Keynote speaker of the conference. I hate saying goodbye to this kind of inspiration. Gary Schmidt–THAT KID IN THE BACK ROW, THE ONE WITH THE RED SHIRT ON. 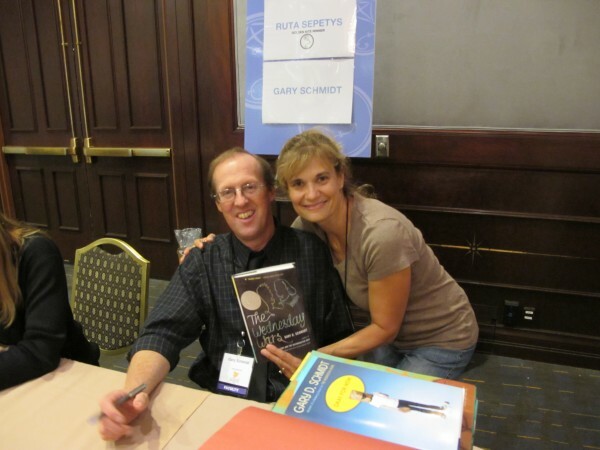 Gary is the author of one of my favorite books–THE WEDNESDAY WARS. *We are at our best with good and healthy routines. We need to pay attention to our surprises. *I was put into Track 3 in first grade–I didn’t learn to read for a very long time. *Never doubt your stories will effect kids. *You write the stories that give your readers more to be a human being with. *You will never learn to love art well until you learn to love what it mirrors better…the world. -Love the stuff of your craft–words. -Give your readers the deepest questions not easy answers. *Does the writing serve? We do not want to be hacks who simply seek fame and fortune. We are in a culture where we cease to cherish our children. We are called to cherish our readers. Yes, it’s a miracle that I’m still alive today because by all rights, after that speech and all the others I heard at the conference, no one would have blamed me if my heart had burst. But that is how you should leave a conference so full of inspiration, hope and motivation that the touch of a feather would cause it to leak out of you. Now it’s time for the autograph party or as I like to call it…Kim gets to hug her heroes. Of course, everyone feels the same way I do, so the line is outrageous LOL! But it goes rather quickly and it’s so worth it. After hearing Eugene Yelchin in the Picture Book Panel I had to have this book, BREAKING STALIN’S NOSE. Can’t wait to read it with the boys! 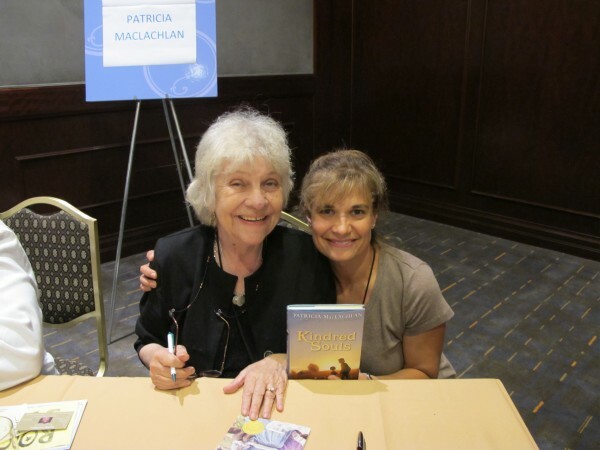 The second page of KINDRED SOULS by Patricia MacLachlan has a Red Tailed Hawk on it. Perfect. Awww Bryan Collier blew me away with his keynote. From that moment on I became a life long fan. 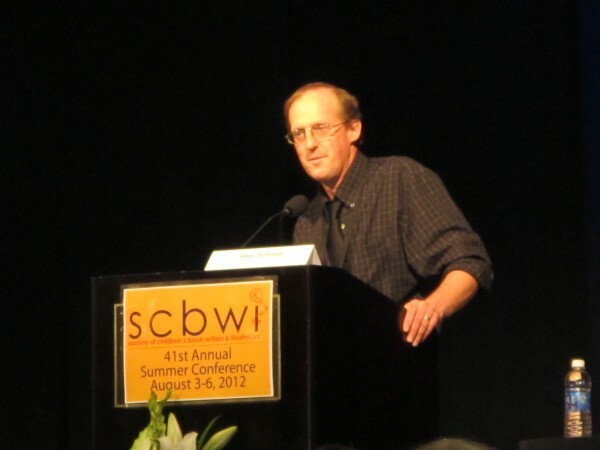 The SCBWI doesn’t get better than this.You must read DAVE THE POTTER! 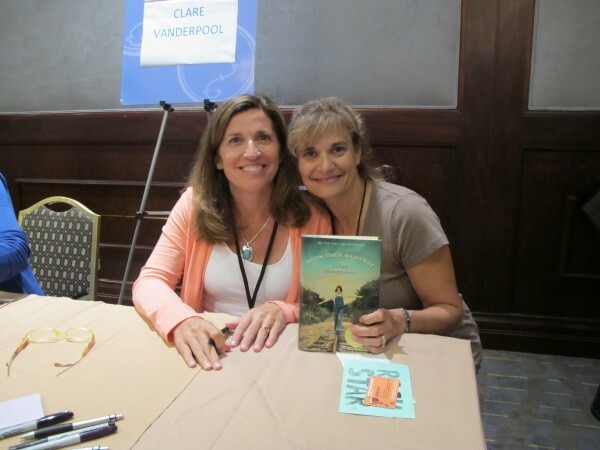 I love Clare Vanderpool and can’t wait to read MOON OVER MANIFEST! It’s Karen Cushman!!! Karen has published seven books since she started writing at age 50, including Newbery award winner THE MIDWIFE’S APPRENTICE. OMG!!! My kids are going to be soooo jealous. They LOVED reading Gary Schmidt‘s THE WEDNESDAY WARS together. It was such a wonderful experience to share my children’s enthusiasm for his writing with him. We can’t wait to read his next book, OKAY FOR NOW together. Pictures are worth a 1,000 words and sometimes us writers CAN just leave it at that–or maybe I’ll have just a little bit more to say about Ruta on Wednesday LOL! 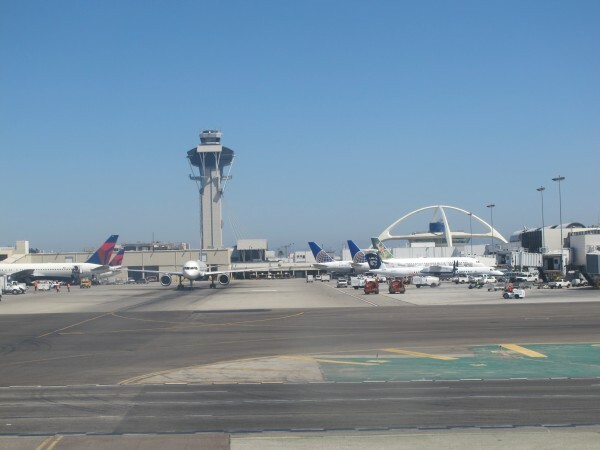 And then it’s over…waving goodbye to LAX. 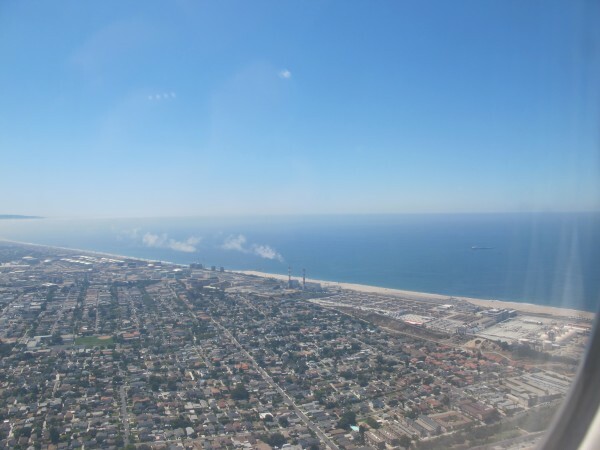 This is still the only view I’ve ever had of the Pacific LOL! 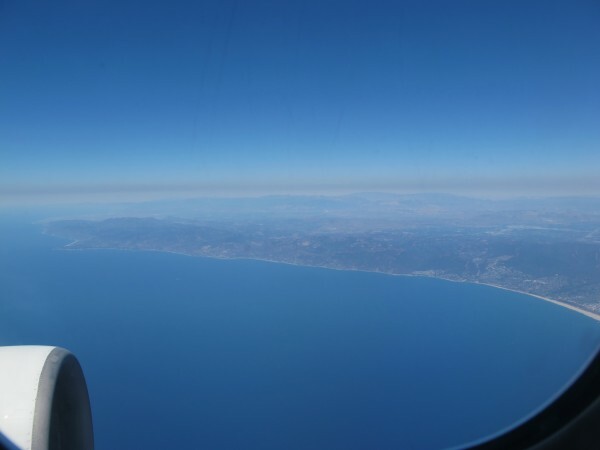 Turning back around over the ocean and doing an LA fly by on my way home. 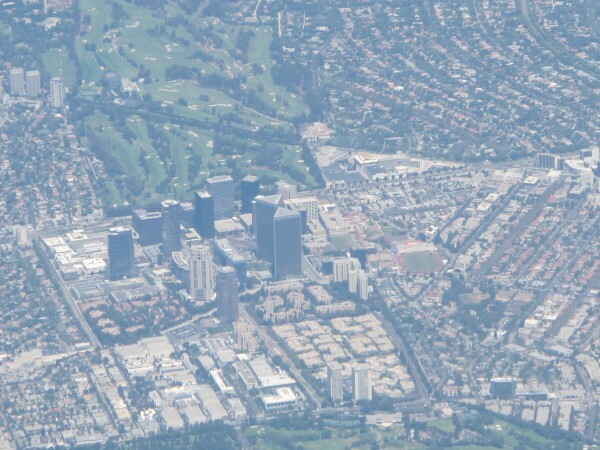 Can you spot the Hyatt Regency Century Plaza? It’s the low building with a curved shape next to the white tower. On Monday there was also a wonderful day of Intensives but I didn’t attend, I was ready to head home and see my family. 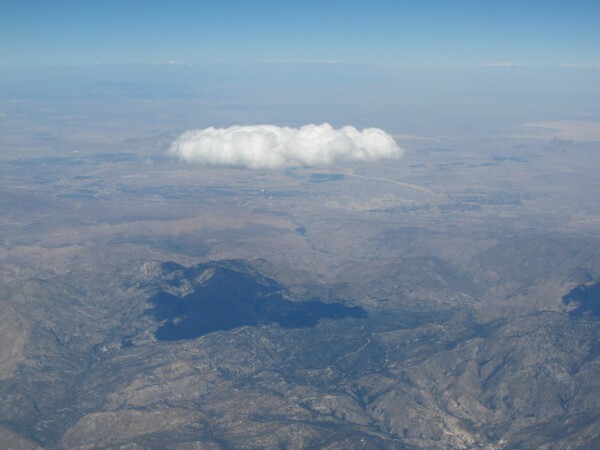 On my way out, I did see this little cloud and I can only imagine that some day it will show up in one of my stories LOL! Don’t forget that you still have a chance to win a Pre-order of TOUCHING THE SURFACE right HERE! 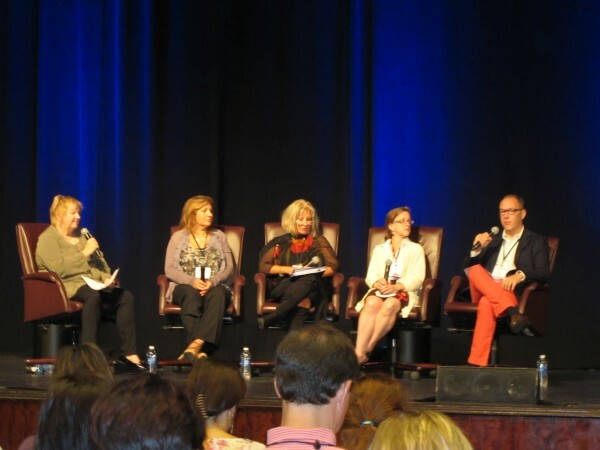 Now that you’ve had a virtual SCBWI Conference, what do you think? Interested in joining the tribe? Already a proud member? Find any authors that you would love to hear? 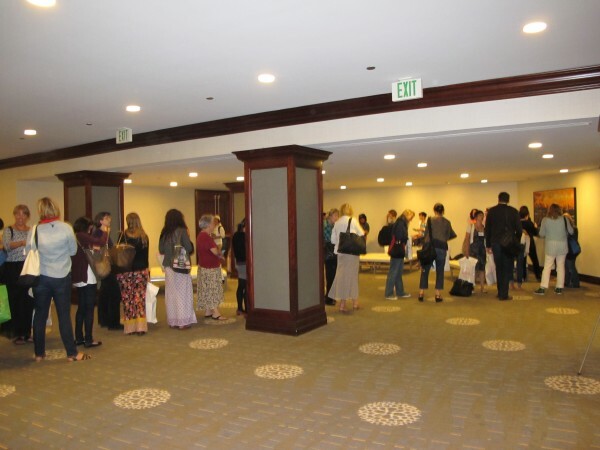 Make sure you request them with your SCBWI RA for your local conferences. Or just check out their amazing books and if you do love them, be sure to take the time to write a review for Amazon, B&N and Goodreads. Your positive support means the world to all authors and illustrators. It will never go unappreciated.